China artist Zeng Fanzhi admits "exhibition-phobia"
(Reuters) - Zeng Fanzhi may be one of the world's most feted and valuable living artists, but the Beijing-based painter says he has little time for the publicity such stature brings. “They are not real landscapes. They are rather about an experience of miao wu [marvellous revelation]. Miao wu constitutes a restless journey of discovery." 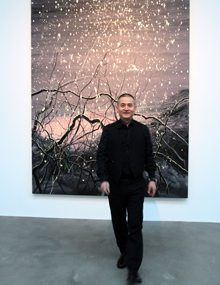 Welcome all the friends to visit my fist solo exhibition in UK Gagosian gallery if you have chance to London before January 19, 2013. 9 recent works are exhibited in 3 spaces separately, some vain among each piece is carefully programmed as in certain traditional Chinese aesthetic objects. Deeply from my heart, thanks for all well arranged by highly professional team of Gagosian, I very much look forward to the communication with viewers through my art. Nowadays I returned to Beijing and began casting new series, can't wait sharing more with you in 2013. This fall I was pleased to be invited attending the annual trustee conference of Museum of Prado in Spain, that offered me a fortune to visit my favorite original pieces of Goya and Rubens over again. What made me deeply impressed is the everlasting energy abundant in classic arts, which I constantly hope that one day viewers who live in China will also be capable of seeing. On the other hand, however, no Chinese version for documentaions is provided in this most renowned Spanish museum. I sincerely wish that through everyone’s effort, this could be coming true in the very near future.